Do you feel concerned about having enough money? Are you concerned about your health? Do you think that life is passing you by? Does a traditional retirement sound a bit boring? Are you retired, frustrated, looking for a little more out of a fast disappearing life, wanting to travel and see the world? Looking for something but a bit fearful of the change and where you'll find support? Looking for sunnier or year round spring weather? We can help you unearth the many benefits of taking a chance. Satisfying your lust for life. Your inquisitiveness. Your open mindedness. Your interest in the world. Your desire to more than have a traditional retirement. Your sense of adventure and find health and fitness. To find contentment and fulfilment living a minimalistic but purposeful life. Taking a chance is risky … but as it's said "no pain no gain". But you can eliminate much pain by being part of a community who are doing what you’re planning to do. A community that is willing and able to provide unbiased information and personal support. There’ll be times you’ll ask “why am I doing this”. But there will be many more times you’ll ask “why didn’t I do this before” or “WOW! The world has so much to offer”. You will be faced with many naysayers ... family and friends who will question your sanity. Gleefully showing you the many negative articles and telling you gloomy stories about what you want to do and where you want to go ... ignore them they are just projecting their own fears and misinformed opinions. Listen to people who have done it. People who are living this lifestyle. Get the facts, evaluate them and make your own conclusions. We have lived this lifestyle since leaving Cebu in the Philippines in February 2017. In August 2017 we embarked on a year long trip around the world - visiting over 20 countries and staying in over 75 cities. I’m now 70. A “nevertiree" who will eventually be benched by life. Passionate about learning and excited by all the change and opportunities available in the world today. My career has been in two halves. After a 25-year corporate life I set out on my own and for the last 25 years or so I’ve been doing my own thing. My 20 year corporate career was fun while it lasted ... the challenges and achievements climbing the corporate ladder. At age 42 I was involved in a multi vehicle accident. Travelling at over 100 kph the driver of a fully loaded tanker truck had fallen asleep at the wheel and crashed into a line of stationary cars and taxis. With the truck's final death roll it came to a stop on top of my car. I was entombed in the wreckage for over five and a half hours. While around me in the fiery mayhem eleven people died. My recovery involved three months in hospital and a year of operations. During the long days and nights, I had many hours to think about my life and my future. It was easy. I’d survived an accident in which I should have died. My successful, comfortable corporate career was over and I’d now venture out on my own. WOW! This was an eye-popping experience! From corporate hero to independent zero! So starting in 1993 I have been involved in establishing, buying, fixing up, working in and selling a number of small to medium sized businesses. An exciting and challenging journey with varying degrees of success. All with interesting stories, coincidences and life lessons. I’ve enjoyed the short-lived thrill of making money and the temporary anguish of losing it. The main lesson learned … it's easier to make money than to hang on to it! At age 59 I had my second serious accident … this time in a bicycle race. A clash of wheels. Me sprawled on the road in excruciating pain with a smashed pelvis. Recovery was slow … 3 weeks in hospital and 3 months on crutches. This marked the end of my cycle racing life. Through these two incidents I understand the anguish of pain and disappointment but through these I also know the joy and reward of pushing through. I have realised the benefits of being fit and not giving up. In March 2017 we completed a nearly four-year contract in the Philippines. Before leaving for the Philippines we sold all our possessions except a few boxes of personal items, 2 mountain bikes and a set of golf clubs! I still exercise regularly ... jogging, walking, body weight exercising and some yoga. Getting slower with age I’ve traded speed for enjoyment! I was born and educated in UK and obtained a Higher National Certificate in Chemistry. I spent over 35 years in the textile and chemical industries in South Africa before taking early retirement in 2007. This coincided with the marriage of my daughter, the last child of three children, and my divorce. So a complete reinvention took place, I completed a CELTA course which has enabled me to teach English as a foreign language ever since in South Africa, UK and the Philippines. Teaching English as a foreign language ever since in South Africa, UK and the Philippines. Teaching has enabled me to meet and make friends with many people from different countries and I get much satisfaction from seeing my students go from strength to strength in speaking English. At the same time I have travelled extensively including treks to Everest base camp, Annapurna in Nepal and Namib Naukluft mountains in Namibia. 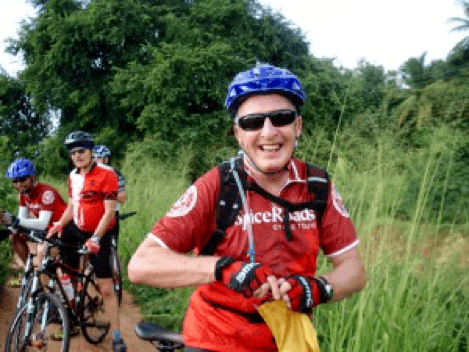 I have done cycle tours around Sri Lanka, Laos and Cambodia. I enjoy cycling, gym, hiking, wildlife safaris, bird watching and generally being outdoors. What I enjoy most about travelling is observing different cultures, lifestyles ,ways of life and in our trip around the world I want in particular to envisage whether I could eventually live in one or other of the countries.